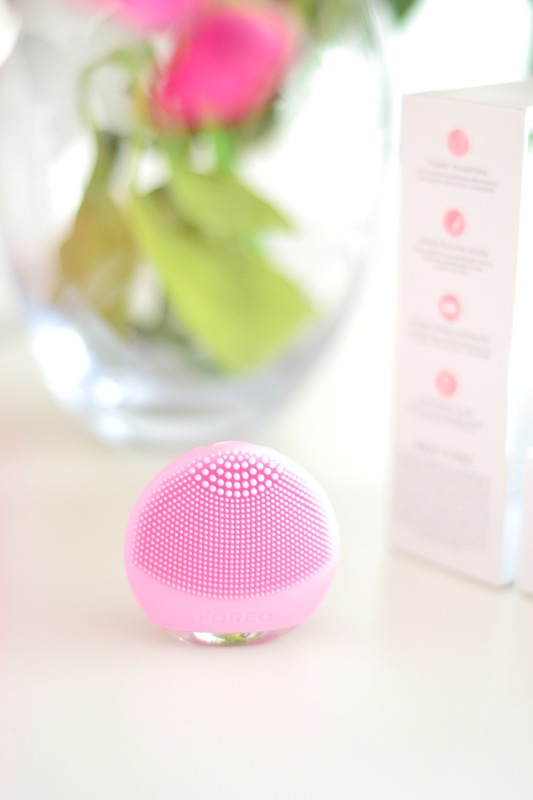 Foreo Says: LUNA go is the perfect skincare device for your busy lifestyle. Get smooth, healthy-looking skin with T-Sonic™ technology in a lightweight design that goes wherever you do. FOREO - what does this even mean? It's simple, 'For Every One'. Prior to getting sent this item to review, I didn't know too much about the brand itself however, with a little bit of research, you'll realise that they're so much more than fun-coloured beauty products. The brand prides itself of bringing you a new standard of high-end beauty products - products that you didn't know you needed, up until now. As you can see, this comes packaged in a lovely little white box which is see-through at the front (see picture above) giving you a glimpse of the product before using it. Take a look at the picture here on the left and you'll notice it says 'FOREO' on the bottom - this actually lifts up as it's a storage section for the charger. Lift the product itself and underneath you have a cute little bag to store the item - along with a quick-start guide manual. A lot of people will look at this and think - "What is this product?" For me, this is the best part of the post - getting to write about the product itself and as I've mentioned above, FOREO are way more than a brand that sell pretty-looking products. They're a brand that are continuously developing and working on bringing unique and innovative products to the market and one of them is the FOREO Luna Go. The lovely pink item which you can see is actually a cleansing device - a portable skincare breakthrough which not only cleanses but also has anti-ageing technology within the device itself and if you look at it - it's no bigger than a cotton pad! The FOREO Luna Go is a lightweight cleansing product or facial brush which cleanses skin, helps to prevent breakouts and also fights the signs of ageing. Consider this as your ultimate travel accessory - it's compact in size, comes with a protective pouch and did you know? 1 charge will last you 30 beauty routines! T-Sonic Pulsations - Switch this on and you get 8000 pulsations per minute to deep cleanse skin. The pulsations remove around 99.5% of dirt and oil. Unique Silicone Design - The unique silicone design is extra-soft, bacteria-resistant and super-hygienic. 1 Charge - This is the ultimate travel accessory as 1 charge will last you 30 beauty routines so it's your go-to travel essential! At first, you might be a little apprehensive when using the Luna Go however - it's really easy and once you start using it, you'll be hooked! I've now started to use this both in the morning and evening, incorporating this into my beauty routine - I just feel like my skin glows after using the FOREO Luna Go so at the moment, I'm really impressed with the product. Here, you can see how I use the item - you can of course switch things up to suit you, your skincare routine and your skin. Morning - In the morning, my skincare routine is simple, I use products that are lightweight and fresh and this is normally my Murad Daily Cleansing foam. After rinsing, I'll apply an extra pump of product onto damp skin and go over with my Luna Go - massaging the skin for about a minute. Night - In the evening, my skincare routine consists of more products compared to the morning. They're richer products that thoroughly cleanse and hydrate my skin - ready for the next day. I cleanse skin using my exfoliating cleanser and once rinsed, I'll apply more product onto skin and use the Luna Go yet again - massaging around the skin for around 2-3 minutes. Once happy, I'll rinse my skin, pat dry and then follow up using my toner, moisturiser or night cream. I always love reading your comments so I cannot wait to see what you all think of the FOREO Luna Go - have you seen this item online and if so, would this be something that you'd look at adding to your skincare routine? They’re so cute. I have this one too, it came with my full size one. I don’t really use them much though because I got the blue one and I think it’s too hard on my skin 🙁 I’ll have to try the mini one though since I have it in pink and I think that’s for sensitive skin. Great post!